Now it is here. We reviewed it exclusively and compared it to the Canon 24-105mm F/4. Let’s see if this lens is also “the one” for you. Facts why this lens is interesting for many? Well, all this sounds like a dream come true. 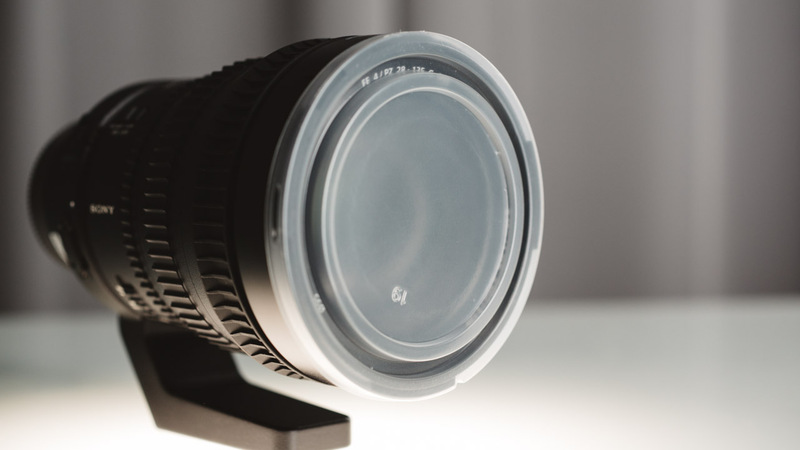 So far filmmakers who wanted a lens for video either had to use an affordable photo lens that lacks many of the features that professionals need, OR use a cine zoom that is usually very heavy and unaffordable. We’ve never had the best of both worlds, a “broadcast” lens for compact, DSLR stlye cameras, but it looks like the Sony 28-135mm has it all. We have an Imatest test chart for resolutions up to 6K here in our office and we compared some of the optical quality factors of the lenses. 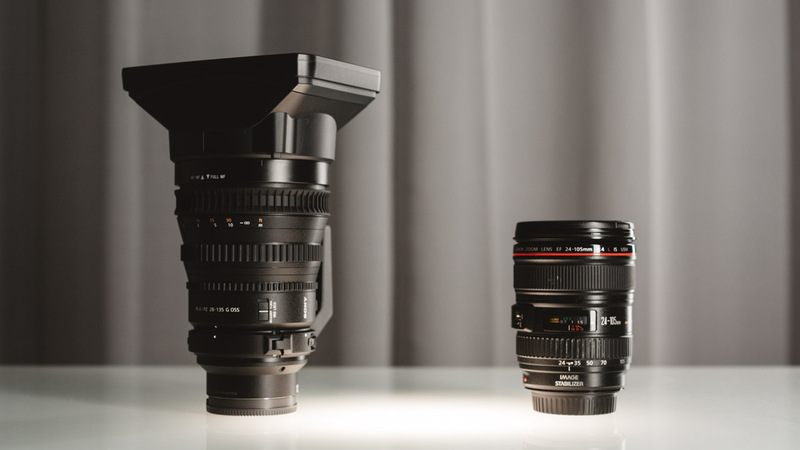 We compared the Sony 28-135mm to the Canon 24-105mm, as the latter is still THE go-to lens for full frame videographers who want to cover a wide zoom range. Sony’s newest cameras feature in-camera lens compensation to correct for corner shading, chromatic aberrations, and geometric distortion. That’s why the Sony A7S will automatically make any Sony lens look better even when in video mode. Of course no Canon lens with a Metabones adapter will make use of this functionality. The benefits of in-camera lens compensation will reflect positively on the Sony lens in this test. And this on it’s own is already an argument for the Sony lens. Looking at the Sony 28-135mm image it is almost 100% straight at any focal length. Quite impressive. Probably not even an expensive cine lens could compete as the Sony lens makes use of the in-camera lens compensation feature. 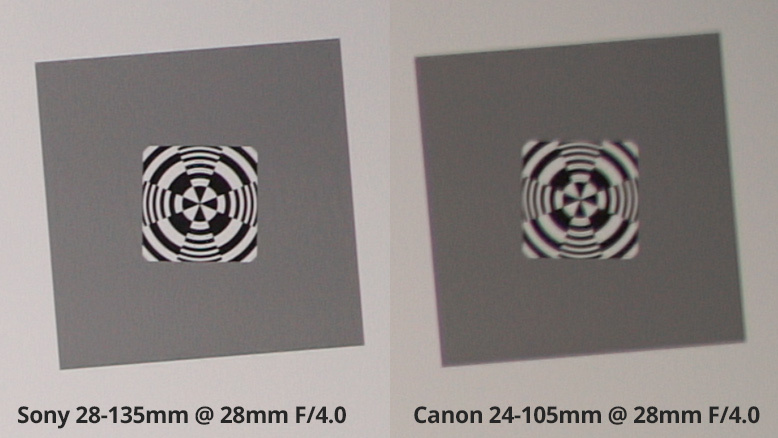 Looking at the 24-105mm image in comparison it distorts in and out on zoom. Applying manual lens correction in post we can also get a more straight image from the Canon, but this is usually not an option in video, definitely not when varying focal lengths are involved. On the Sony at 70mm there is 1 pixel distortion on a horizontal line at the upper edge of the image. On the Canon at 70mm it’s 21 pixels. The performance on the Canon is still good. 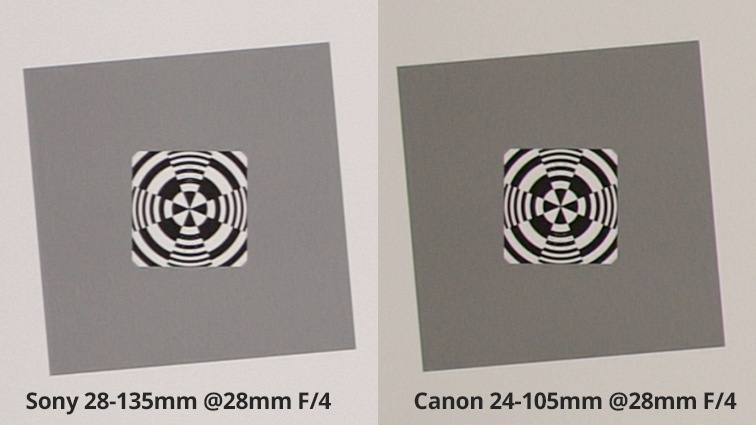 People who have used the Canon 24-105mm F/4 lens know that F/4 is not actually F/4. Especially when zooming in the image becomes radically darker. On the Canon at 28mm as well as 70mm we observed that the image had to be brightened up in post by 0.55 stops to retain the correct brightness throughout. The Sony lens had to be brightened up by 0.2 stops. The Sony doesn’t have a clean F/4 either, instead it seems to start at F/4.2. However it performs a lot better than the Canon. But even on the Canon performance seems rather good. 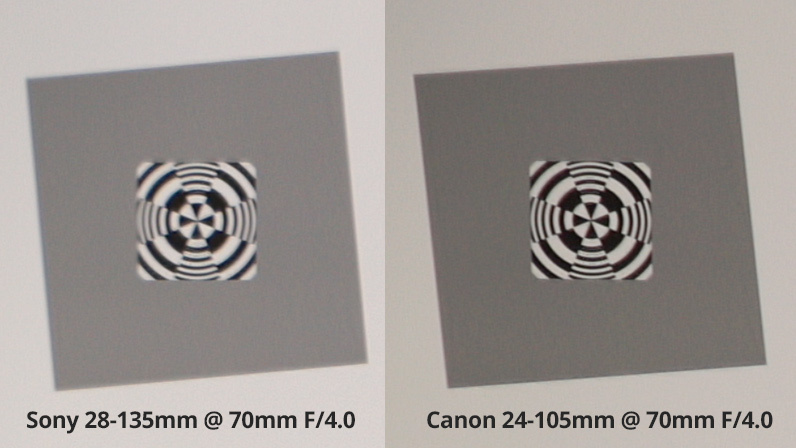 On the Canon there’s little difference between chromatic aberration on F/4 or F/8 for example and it’s all hardly noticeable shooting 4K at F/4. The measured Lateral Chromatic Aberration on the whole image goes up to about 0.1 pixels on the image edges for the Sony 28-135mm @28mm and F/4.0 while it goes up to about 0.35 pixels on the Canon 24-105mm @28mm and F/4.0. We didn’t measure Vignetting in detail. Both lenses have some degree of vignetting, but it is not severe. It is most apparent when fully zoomed in on both lenses and it is more severe on the Canon than on the Sony. @ 105mm Canon performs good. @ 135mm Sony is quite sharp and performs better than Canon @105. Concluding optical the Sony lens wins in (almost) all areas. In terms of looks theSony is a lot cooler (more neutral) than the Canon and appears to have a tad more contrast. 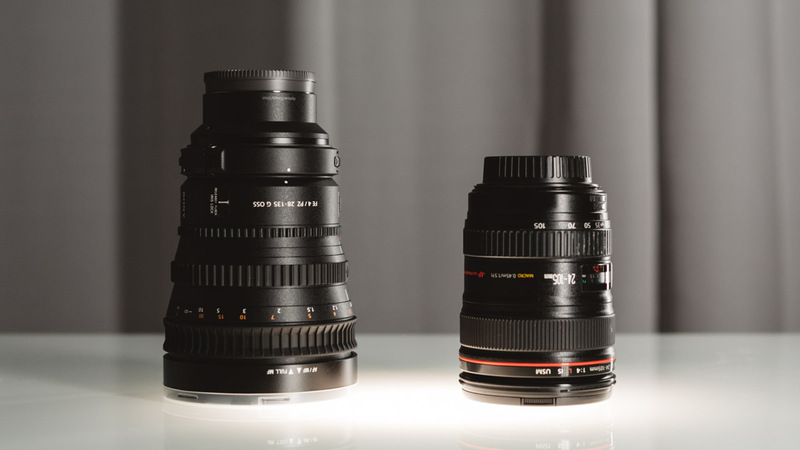 In terms of handling these lenses are quite different. In terms of size & weight the Sony 28-135mm might be a lot less clumsy than other cine zooms, but it’s almost twice as heavy and twice as big as the Canon 24-105mm. On the Sony A7S I must admit this makes a huge impact. Not the camera, but the lens becomes the centre of attention as it’s much more heavy than the camera itself. 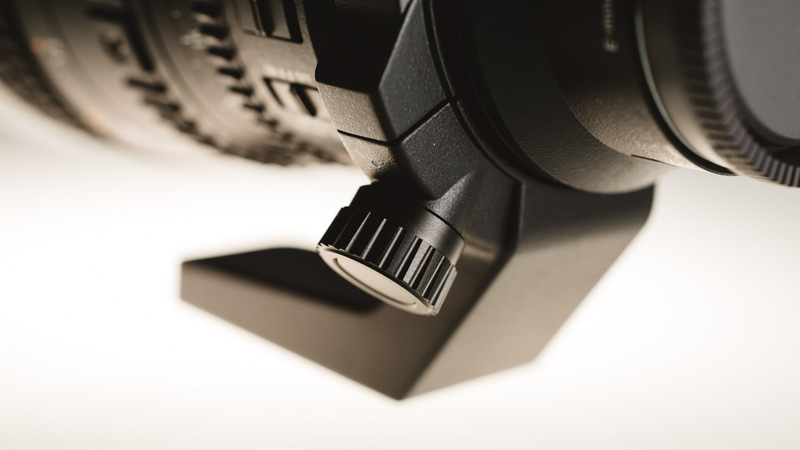 While many aspects of the lens make it more ergonomic, this point can be a huge drawback. 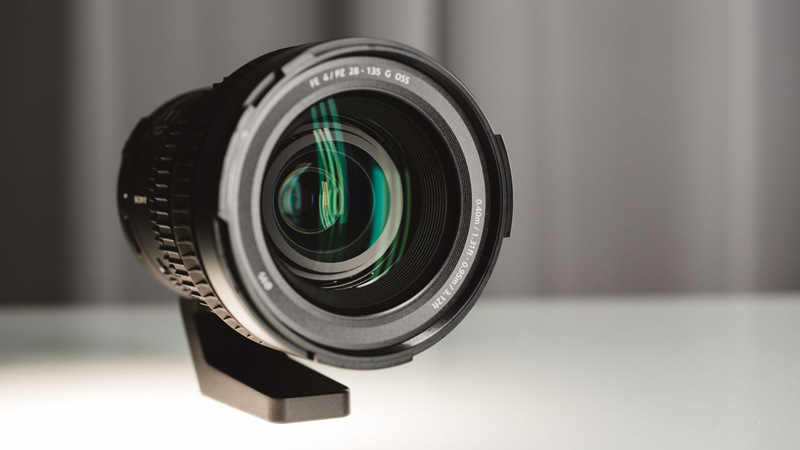 Because of it’s weight, you will in many cases be forced to use a rig or tripod to use the lens properly. Shooting from the hand is not so easy (but possible). It seems Sony decided to ship this lens without a lens cap. Instead users are forced to use the clumsy “mattebox” lens shade that comes with it and has a square cover. The lens comes with a plastic cover protection. But this is paper thin, barely remains on the lens and is definitely not a replacement for a proper lens-cap. 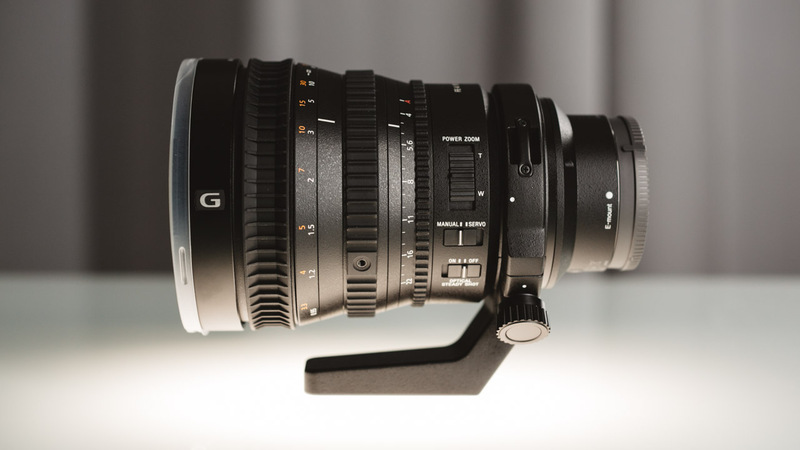 The Sony 28-135mm is a hybrid cine / broadcast / compact lens. It is obviously an attempt to merge electronic control with manual control. 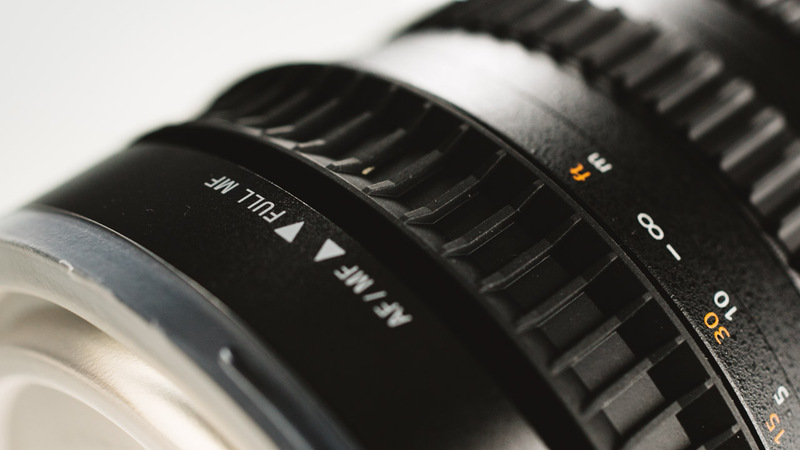 We notice when we see that the focus ring is actually the only mechanical part on this lens. Both the zoom as well as the aperture are controlled by internal servos while the gear rings only serve as controllers. They do a pretty good job at that and at first it’s quite hard to notice. 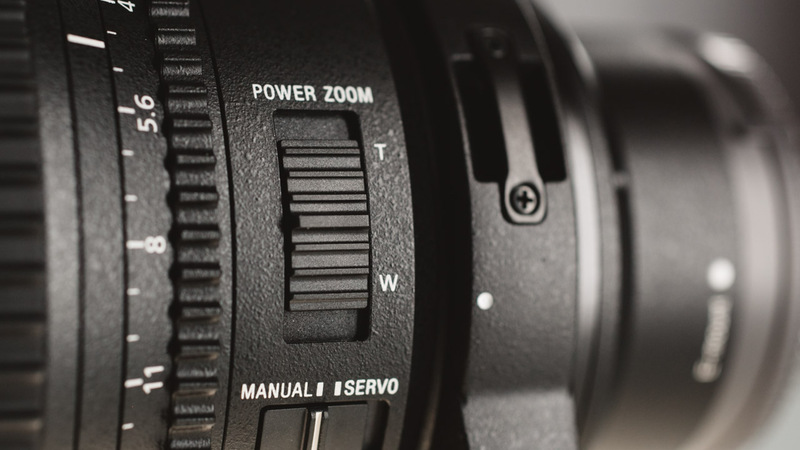 The servo zoom lets you control the camera via a zoom rocker that is built into the lens. This micro zoom rocker has 2-3 zoom speed stages and allows for surprisingly smooth zoom control right on the lens. On Sony cameras that support an external zoom rocker the lens zoom can be controlled remotely. This is extremely handy and makes this lens work like a traditional broadcast lens. 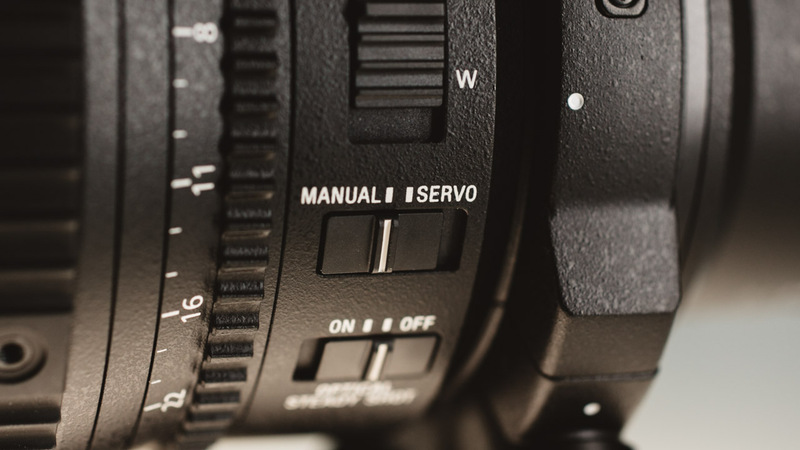 The Sony FS7 handgrip comes with this functionality. The downside: No possibility to do crash zooms! So you cannot zoom in very quickly, you’re always restricted to the pacing of the servo. Crash zooming comes in very handy for fast documentary style focusing on parfocal lenses. The Sony 28-135mm is a parfocal lens, meaning it stays in focus when the focal length is changed. In the video above I compared the optical image stabilisation between the Sony 28-135mm and the Canon 24-105mm. As you can see the Sony performs a little better both at wide angles as well as fully zoomed in. The Canon image stabiliser is good and has a natural feel, but the Sony stabiliser seems more consistent and efficient, especially at wide angles. The build quality of the Sony 28-135mm can be felt immediately when the lens is taken out of the box. It’s dust and moisture resistant, made of high quality materials and feels very solid. The gear rings are made of strong rubber and thus provide a very good grip for use with your hands. On our test lens the lens support bracket wasn’t locked hard enough for larger setups. In our test we used the Sony A7S with an Atomos Shogun. With minor force the whole setup was rotatable thus not offering enough safety as a lens support bracket for video. There is no focal length indicator on the lens or in camera, so it is not possible see which focal length you’re on. Only during zoom in zoom servo mode there is a readout on the camera screen. 28-135mm is a great focal length range for a full-frame zoom lens. When used with a super 35mm or APS-C sized sensor like the Sony FS7, then the focal length is not ideal and could be for many too narrow. The zoom ring rotation direction can be switched in-camera. The iris ring can be set to step increments, or smooth iris (de-clicked). 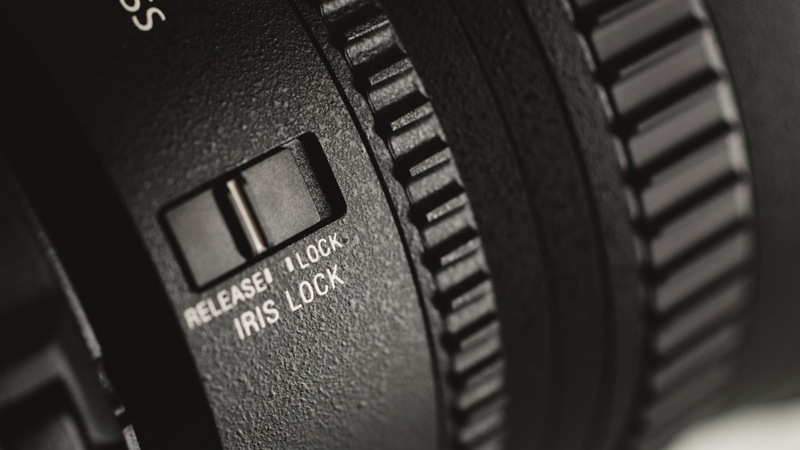 The iris can be controlled in-camera as well. The iris ring can be locked down, so it is not changed by accident. The lens has auto focus as well. It works similarly fast to other Sony photo lenses. The Sony FE PZ 28-135mm f/4 G OSS Lens is truly a stunner. It comes with many very useful (if not essential) features for professional shooters and brings broadcast lens functionality into the full frame world at a compact size. Optically the lens is better than the very popular Canon EF 24-105mm lens in any area. The great build quality, internal zoom, parfocal construction and superb image stabilisation make it a lens of choice for video shooters. So yes, it delivers all a video lens for full frame should have, but it doesn’t come without downsides you should consider: It is twice as heavy as the Canon 24-105 and it is definitely more clumsy to use. While the servo zoom is beneficial it won’t let you do crash zooms. Also remember this lens only works on Sony cameras, while Canon lenses can be adapted to Sony. Other small points of concern are the missing front cap and support bracket that can’t be fully locked. Aside from these minor design flaws the lens offers really a lot of essential benefits that any full frame documentary style shooter will enjoy. Most importantly the focal length of 28-135mm is just ideal for full frame, while it may not be ideal for super 35mm sized sensors. All in all, if you can live with the weight of the lens, and if you use Sony cameras, then we think this piece of gear is well worth every dollar of the $2,498 investment it requires. The lens will start shipping next week. If you enjoyed this review, please pre-order it at our partner B&H HERE. 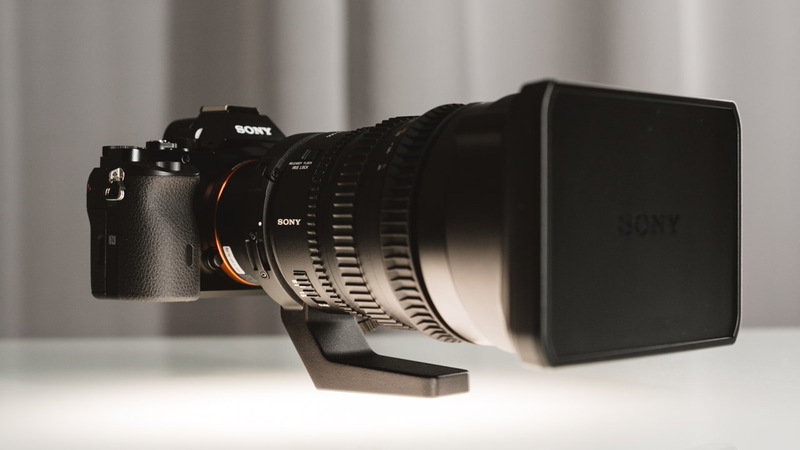 The post Sony 28-135mm Review – Why This Might Be “The” Cine Zoom Lens For You appeared first on cinema5D.